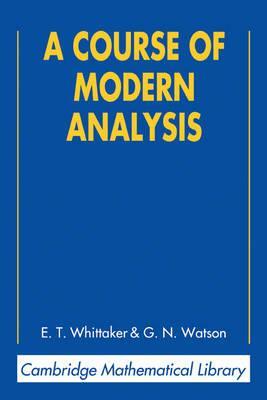 This classic text is known to and used by thousands of mathematicians and students of mathematics throughout the world. It gives an introduction to the general theory of infinite processes and of analytic functions together with an account of the principal transcendental functions. 1. Complex numbers; 2. The theory of convergence; 3. Continuous functions and uniform convergence; 4. The theory of Riemann integration; 5. The fundamental properties of analytic functions; 6. The theory of residues; 7. The expansion of functions in infinite series; 8. Asymptotic expansions and summable series; 9. Fourier series and trigonometrical series; 10. Linear differential equations; 11. Integral equations; 12. The gamma function; 13. The zeta function of Riemann; 14. The hypergeometric function; 15. The Legendre function; 16. The confluent hypergeometric functions; 17. Bessel functions; 18. The equations of mathematical physics; 19. Mathieu functions; 20. Elliptic functions; 21. The theta functions; 22. Jacobian elliptic functions; 23. Ellipsoidal harmonics and Lame's equation.